SIGN UP FOR POINT! PUBLISHING’S E-NEWSLETTER! At Point! Publishing, our goal is to create a sense of local pride, build community and inform residents. Point! 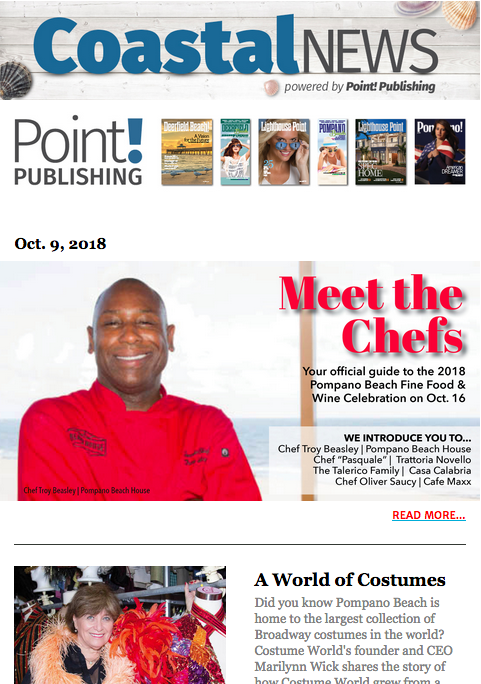 Publishing’s email newsletter is a great source for local news, events, featured articles and city announcements in Pompano Beach, Deerfield Beach and Lighthouse Point. Plus, receive the digital edition of our magazines complimentary in your inbox every month. Fill out the form below to get added to our email distribution list! We appreciate you being an active member of your community!